Many of Arizona’s State Parks preserve fascinating bits of history or provide chances to hike, splash and fish, or protect vital wildlife habitat. Take some time to visit these beautiful and historic parks. In Sedona, slip into the famous Oak Creek water slide at Slide Rock or take a hike at Red Rock to see the majesty that is Cathedral Rock. If you’re heading south Kartchner Caverns is a must see. Stand in a “living” cave that breathes out cool air and enjoy the improvisations of stone formations. 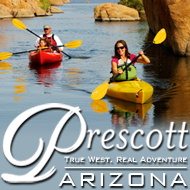 For park maps, driving directions, and photographs visit www.AZStateParks.com. Enjoy a relaxing cruise on one of Arizona’s most beautiful desert lakes! Experience the splendor of the canyons, wildlife, and unique desert plants in their natural habitat. Dolly Steamboat Tours provide an entertaining and educational experience for explorers of all ages. Located at the east end of Apache Junction, turn north on Hwy 88 (Apache Trail). Paved Roads all the way. Twilight dinner cruise, for more information call, 480-827-9144 or visit www.dollysteamboat.com. Discover Mormon Lake Lodge, a 300 acres retreat amidst Ponderosa pines within the Coconino National Forest. Explore miles of forest trails by horseback riding, renting a mountain bike or ATV. Experience the solitude of nature by hiking or fishing at a nearby lake. Relax in a cozy cabin or campground and savor meals grilled in the famed open-pit Steakhouse with live music in the Saloon. For a well deserved retreat, call 928-354-2227 or visit www.MormonLakeLodge.com. The Sonroan Desert is one of the foremost hot air ballooning areas in the entire world. Float low over the top of the desert to see the wildlife that is out for the day. Then go high to get a great view of the entire valley. Upon landing you are greeted with the traditional flutes of champagne followed by a sit down breakfast in the desert. FAA Certified, Insured, Uniformed. You’ll have memories that last a lifetime. Call now for reservations 480-502-6999, 800-831-7610 or visit www.HotAirExpeditions.com.